A small-town boy hops a bus to New York City to crash an audition for E.T. : The Musical. Tim Federle writes a warm and witty debut that's full of broken curfews, second chances, and the adventure of growing up—because sometimes you have to get four hundred miles from your backyard to finally feel at home. I was so excited to read BETTER NATE THAN EVER because I'm a huge fan of musical theater. As a kid, I'd gone through the wringer during auditions numerous times, so I knew I'd be able to relate to the protagonist, Nate. I thought I was in for a light-hearted romp that took the reader backstage for a peek at broadway culture, but I came away with so much more than that. Nate is a square peg trying to fit into the round hole society — and his family — have thrust upon him. In a typical all-American town, where boys are expected to like sports, be tough, and do *manly* things, Nate's love of singing and broadway sets him up for countless jabs at school, and even a few jabs to his face and gut. But when he steals away for a weekend to New York City to audition for E.T. the Musical, he finds an entire city of people just like him — a place where freaks and geeks alike can be themselves without fear of a beating or becoming a social outcast. What I loved most was that a huge part of BETTER NATE THAN EVER is about finding your "tribe," finding where you belong and surrounding yourself with people who encourage you to be who you truly are. To not hide your true self, but rather let it shine, unabashedly. Federle has a beautiful, first person narrative that truly spoke to my inner 13-year-old. He captured a middle grader's voice perfectly, and his humorous metaphors were insightful and original. There were several times I went back to read them over just because I thought they were so brilliantly spot on. Federle makes you think about the world in new ways and expands your heart and mind. BETTER NATE THAN EVER is narrated by Nate as though he's standing in front of you, telling you his story, so you get a lot of introspection and reflection. He also shares past memories at times to get you up to speed on his emotional journey. Readers who prefer non-stop action might overlook this book, but Federle's easy-going writing style is quick-paced and easy to fall into, and the humor will be a big plus with kids. Loved Better Nate Than Ever! I won Better Nate Than Ever by Tim Federle from World Spelunking, and this is my honest review. To start off I’d like to say that this book is a middle grade book. Now I haven’t read that many middle grade books so I was a little skeptical as to if I would like middle grade novels. But I’m glad I gave it a shot because these kind of books give you a break from the crazy drama of YA. 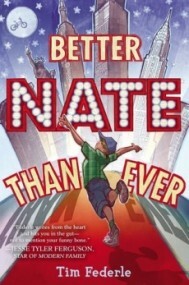 Better Nate Than Ever is about a boy named Nate of course who has dreams of being on Broadway. So with the help of his best friend Libby he sneaks off to New York to audition for the part of Elliott in E.T. the musical. I have to say I loved this book for so many reasons! Young kids like Nate himself don’t have many chances at something big like that because either their parents don’t believe in them enough to let them have a shot or theres just no possible chance for them to get to the places they would need to be. But this book shows us that no matter what your dreams are you probably can find someway to make them come true. Just like Nate does by sneaking to New York. I’m not into the whole plays/Broadway thing so that alone made me a little apprehensive about reading the book, but you didn’t really need to be a fanatic about that stuff too like the book because it was more about Nate reaching his goals then anything. It was quite satisfying to see him really work for his dreams and get rewarded. 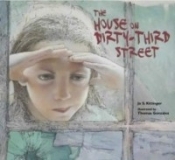 Another thing that stands out in this book is the friendship between Nate and Libby. First off Libby believes that Nate can do whatever he sets his dreams to which is amazing, its always good to have someone believe in you. Second Libby does anything she can to cover for Nate to make his dreams come true she never gave up on him no matter what. I’m honestly trying to think of something no matter how big or small that I didn’t enjoy about this book and I can’t think of a single thing. Tim Federle did an awesome job developing his characters and making this a very believable story which gets a solid 5 out of 5 stars.